1Look at how particular vendors have handled the evolution of their digital camera lens systems when they’ve added features. Some features, such as automatic metering and focusing, can’t be added to very old lenses built before these features were invented. 2Explore how well a vendor supports its older model cameras and flash units. Vendors are continually improving their electronic flash units. As a result, the latest speedlights might not be compatible with newer or future cameras. 3Figure out which filter size fits the most lenses. This is especially true before making an investment in polarizers, infrared filters, and close-up lenses that can be fairly expensive. 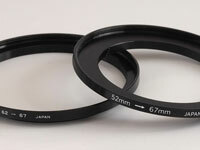 You might find that the clearest upgrade path is to buy the largest filters and then adapt them to other lenses by using step-down rings, as shown in this figure.